By studying the motion of stars over nearly a decade in the Hubble SWEEPS Field, shown here, scientists have been able to better understand the early years of the Milky Way. NASA's Hubble Space Telescope has peered far back in time, detecting clues about how the Milky Way galaxy came together, shortly after the universe's birth. Astronomers trained Hubble on the Milky Way's dense central bulge and spotted a population of superdense stellar corpses called white dwarfs that are remnants of stars that formed about 12 billion years ago. These stars are archeological evidence of the first few billion years of the galaxy's history, researchers said. Like other spiral galaxies, the Milky Way harbors a dense central bulge surrounded by wispy spiral arms. Scientists think that such bulges formed first, while the outer arms came later. "The Milky Way's bulge includes almost a quarter of the galaxy's stellar mass," Calamida said. "Characterizing the properties of the bulge stars can then provide important ways to understand the formation of the entire Milky Way galaxy and that of similar, more-distant galaxies." But studying the Milky Way's core is a challenge; Earth's sun orbits on one of the outlying arms, with stars lying between Earth and the galaxy's star-packed heart. An image of the heart of the Milky Way shows the location of ancient white dwarfs. At left is a ground-based image of the galaxy's central bulge; the upper right shows a small section of Hubble's view of this region, while the lower-right image depicts four white dwarfs spied by Hubble. 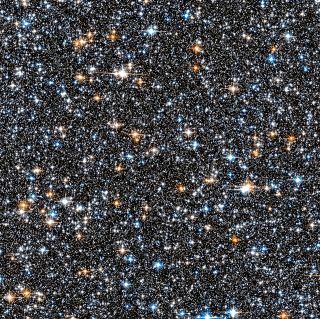 Using Hubble, the team studied the motion of about 240,000 Milky Way stars over nearly a decade. By comparing how the positions of these stars changed over that time, the researchers were able to pick out 70,000 that inhabit the bulge. The team found that the galactic center contains slightly more low-mass stars compared to the outskirts. "These results suggest that the environment in the bulge may have been different than the one in the disk, resulting in different star-formation mechanisms," Calamida said. The astronomers also identified 70 white dwarfs in the bulge sample, by comparing the stars' colors to those predicted for white dwafs by theoretical models. Finding white dwarfs is no small feat; since these corpses no longer undergo fusion, they are quite dim. Indeed, NASA officials compared isolating a white dwarf from the background to searching for the glow of a pocket flashlight held by an astronaut on the moon. But studying white dwarfs is worth the effort, the researchers said. Doing so can reveal information about the stars that built the Milky Way's core nearly 12 billion years ago, researchers said. (For comparison, the universe is approximately 13.8 billion years old. )"These 70 white dwarfs represent the peak of the iceberg," study leader Kailash Sahu, also of STScI, said in the same statement. "We estimate that the total number of white dwarfs is about 100,000 in this tiny Hubble view of the bulge." With Hubble pushing the limits of what can be seen, it will fall to other instruments to capture even fainter stars, Sahu said. "Future telescopes such as NASA's James Webb Space Telescope will allow us to count almost all of the stars in the bulge, down to the faintest ones, which today's telescopes, even Hubble, cannot see," Sahu said. The researchers said they intend to analyze other portions of the same field of sky, ultimately leading to a more precise estimate for the age of the galactic heart. The results were published in September in the Astrophysical Journal. Follow Nola Taylor Redd on Twitter @NolaTReddor Google+. Follow us at @Spacedotcom, Facebookor Google+. Originally published on Space.com.